Yesterday (2008-10-05) I managed to do a really clumsy thing. I had my brothers visiting playing Zack & Wiki (not new but awesome!) so I was a bit out of focus when I battled with separating frozen bread slices for us to toast. After chopping away with less sharp tools I carelessly decided I would use my Global bread knife I got for my 25th birthday last year. It worked fantastically well, even too well. I had of course applied way too much force as the row of frozen slices previously had seemed like a solid object, but now the knife went straight through, into my unsuspecting fingers. The first few moments of shock is quite unsettling. 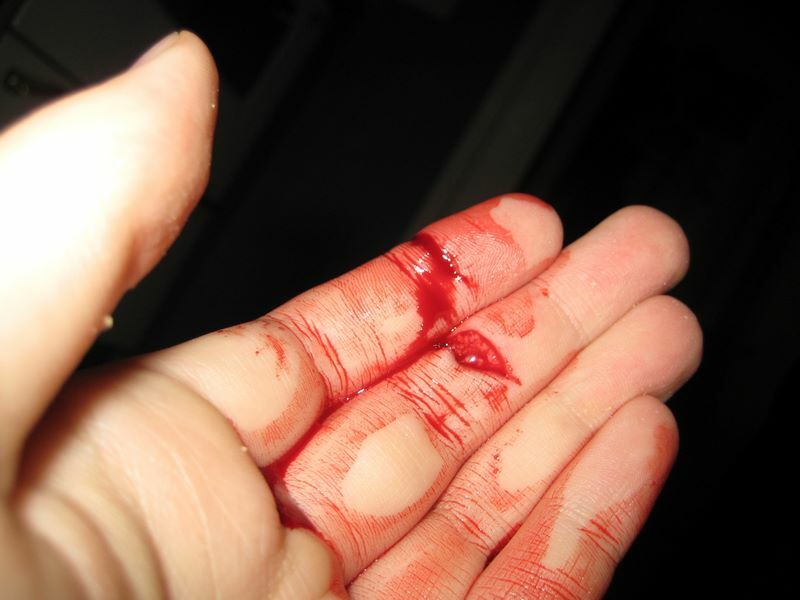 The sight of huge gaping gashes in your fingers is completely unreal, until the blood starts gushing out and you realize you should like… try to stop it. I ran to the sink to not spill my blood everywhere, but I was getting lightheaded and felt like fainting so I got some tissue paper under my hand and laid down on the floor instead. I called out for my brothers so they could phone my father, that was my instinctual reaction. My father later managed to arrange a time at the emergency watch and an hour later I was sitting in the waiting room filling out the damage report. 40 minutes later I got into an operating room and they began cleaning up my hand before the doctor would arrive, which took another 20 minutes. 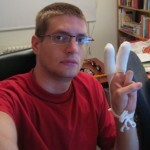 The doctor had me straighten my fingers which hurt a whole lot and sent a funky jolt of pain through my index finger. At first they did not deem my injury very serious as a lot of dried up blood made it hard to see the severity of the cuts, so they went to another patient while the injected anesthetic got to work. 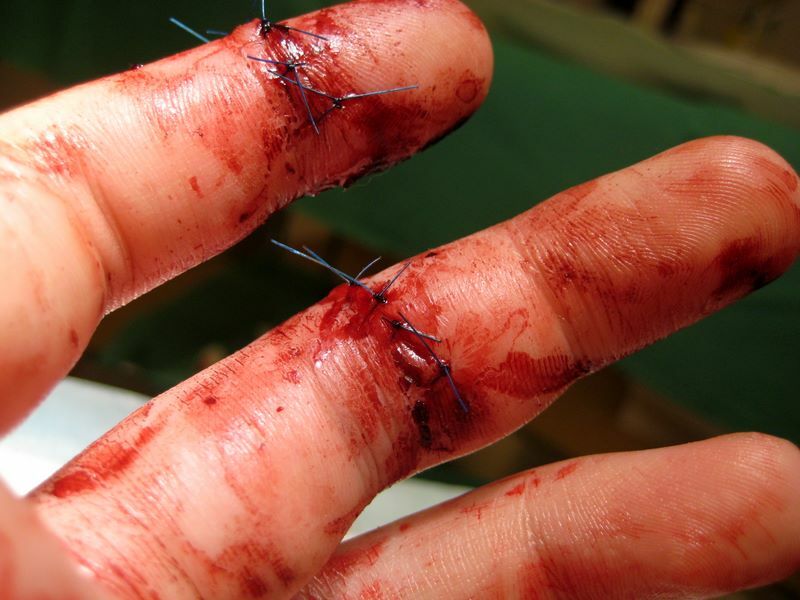 They got back a while later and began sewing me up. She originally did not think it was very deep, but due to the blood pumping out of the cuts she changed her mind. 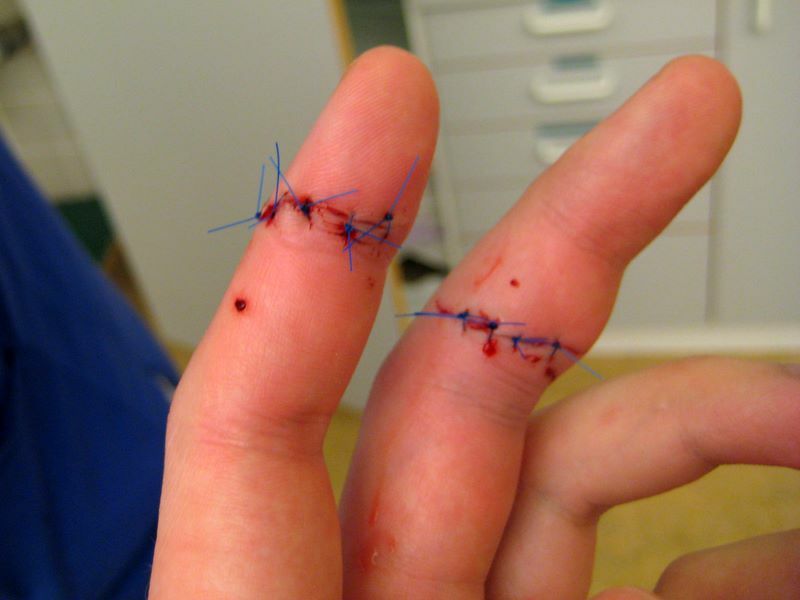 Instead of her first suggested one stitch on my long finger she used four, and five stitches on my index finger! The anesthetic was not completely working when she started sewing but as I wanted it over with already I endured three or four stitches I could still feel, but after that I did not feel any of the others. Now I am home from work trying to take it easy. Just using my fingers a little is quite painful, but I did get a fair amount of sleep tonight. Painkillers woohoo! You might have noticed the friendly images in the text, below are some of the bloody and scary images, so if you are not into that kind of stuff avoid clicking the links! I have also added a warning screen if you step through the images in the display system. THE FOLLOWING IMAGES CONTAIN BLOOD & GORE!! I have been careful when cutting things throughout my entire life, so I am not quite sure how I got to this point. My guess is that it was a mix of distractions, stress and frustration. Distracted as the others were playing a video game, and I was interested in the puzzles, stress as I was already late preparing the food and we were very hungry, frustration as I could not get the slices to separate! And when it comes down to it, I was not even trying to cut something, I was just going to separate them! Of course I have gotten many tips and ideas of how to separate frozen bread slices without damaging your fingers now, like I wont think twice the next time. 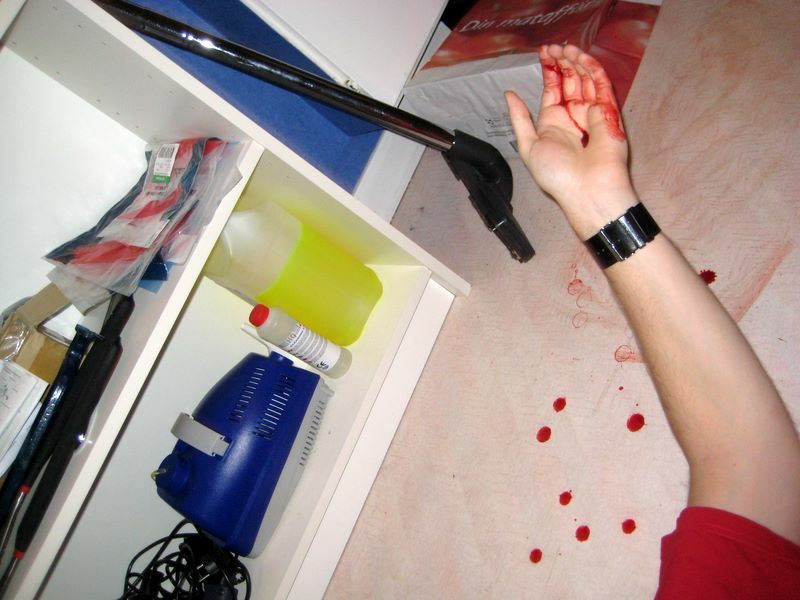 This entry was posted in Real Life and tagged Blood, Canon Ixus 75, Injury, IRL, Photos. Bookmark the permalink. 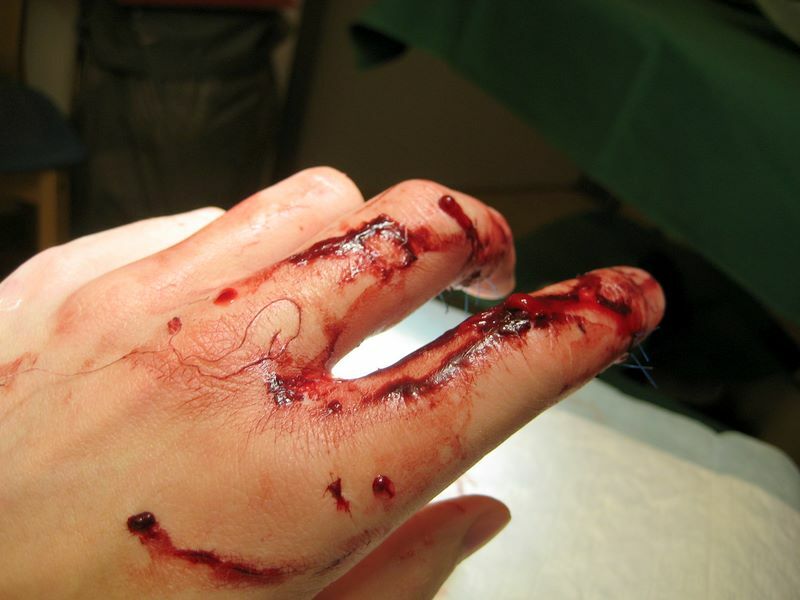 10 Responses to Knife, meet Hand! Haha, thank you mister JolT :P This event might have been the lesson I needed, but I guess more instructions can’t hurt. :D Mister ash! Yes, it sure changes your entire real world feedback… but I’m still hoping some of the nerves will manage to grow together. It takes at least half a year, but probably longer… or if I’m unlucky, never. Time will tell. The biggest problem isn’t really that my fingers are weird now, but that it constantly reminds me of the event that caused it. At least I still have my fingers! This is a tough lesson that keeps telling me to look at the bright side of life! :P Thank you for your concern! 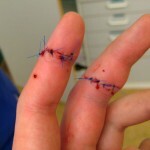 Pingback: A. Aronsson's WeBOLLog » Blog Archive » Knife, meet Hand! – The Anniversary! Oh, it was long. I had a hard time gripping things for a couple of months, and was probably not entirely comfortable until 4-6 months. It has been a number of years now so I cannot remember that clearly. It might be mentioned in my other posts on the subject :) on in the comments to them.